2 CDs with book. 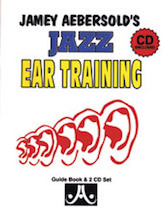 A no-nonsense approach consisting of two hours of recorded ear training exercises with aural instructions before each. Beginning to advanced. Starts very simply, with intervals gradually increases in difficulty until you are hearing chord changes and progressions. All answers are listed in book. Book contains transposed parts for C, Bb and Eb instruments to allow playing along.